It starts: “DISASTER! At 5:12 a.m., April 18, 1906, the ground beneath San Francisco began to tremble;” and much of the city was destroyed by the earthquake and the resulting fire, along with many of the historical, genealogical and family records held in the city repositories and homes. 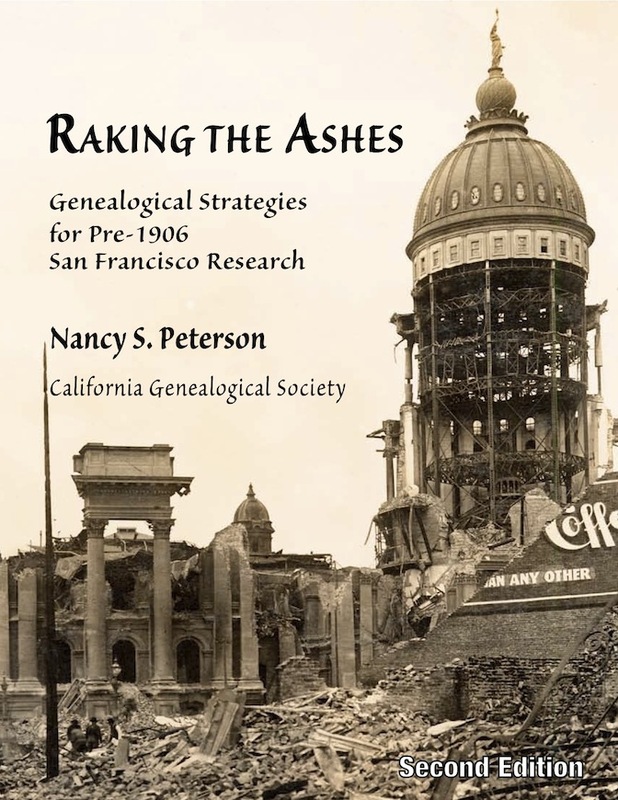 The Second Edition of Raking the Ashes: Genealogical Strategies for Pre-1906 San Francisco Research, by Nancy S. Peterson, published by the California Genealogical Society in Oakland, California, is a unique work for genealogical research. This Second Edition extensively revises, updates and expands the previous edition, first published in 2006. This is a pre-publication review. The projected publication date is June 2011. Part I. Original Records: What did and did not survive, with work-arounds for lost records. This section covers: Vital (civil) records (birth, marriage, death); mortuary, Crematory and coroner's records; Cemetery and columbarium records; Religious records; Newspapers: films, indexes, abstracts and online digitizations; Census enumerations and indexes; San Francisco city directories; Municipal records: annual reports, tax records; Land records; Original and appellate court records: naturalization, probate, land, divorce and adoption; Voting records; Immigration: overland arrivals, passenger lists and passports; Military records; Records of fraternal organizations and benevolent societies; Institutional, business and occupational records; Pre-statehood Spanish and Mexican records; Diaries and first-hand accounts; Ethnic records and resources. Part II. Continuing the Search: Additional Resources: Biographical and historical publications; The California Information File; Records of pioneer and other lineage societies; Help from internet resources; Family History Library resources; Local repositories; Professional research assistance. Part III. Research Techniques for Solving Genealogical Problems: Assembling and assessing the evidence; The Basics: census and city directories; A quick survey of the most-used resources; A less-used source: religious records; Location, location, location; Expanding your search: wider and later; Naming complications; Thinking beyond San Francisco; Source summaries: Where to find what; Putting it all together. Appendix. Pre-Earthquake Newspaper Collections: Titles, Local Sources and Dates of Coverage. For the family historian with San Francisco ancestral families, this book is priceless! The descriptions of the records lost, and the records still extant, are very useful. Each section in Part 1 provides lists or ideas for substitute records – how to find information that helps to define the lives of the residents before and after 1906. The substitute records are often found in repositories and archives within the San Francisco Bay area, or outside the Bay Area. Some records can be found in online repositories, but most of the records discussed are in archival form, without indexes, in repositories that must be visited. For the family historian with California ancestral families outside of San Francisco, the records displayed and suggested offer excellent research opportunities in non-Bay Area repositories and in online historical collections. Website URLs for record collections and for repository catalogs are provided throughout the discussion of the records in Part I and II. Along with the description of the historical records lost or extant is the historical context in which the records were created. There are numerous descriptions and lists of churches, cemeteries, funeral homes, newspapers, city directories, courts, fraternal organizations, and other resources, that trace the history of these institutions. The author recommends starting with Part III if readers are not familiar with genealogical research concepts and records. This section also has three page-size tables of “Where to Look for...” birth, marriage and death information that list resources and if information about dates and places are provided. These lists could be applied to many other locations by substituting the specific details about local newspapers and repositories. There is a wealth of photograph, map and document images showing the materials that might be found in a well-organized search for the original and substitute records. The map on page 182 shows the extent of the fire damage after the earthquake – it comes within blocks of the home of my wife's McKnew family on 19th Street! The Appendix provides a comprehensive list of pre-1906 newspapers published in the San Francisco Bay Area that may have information or articles about ancestral families. General newspapers and specialized newspapers are covered with the period published, and the holdings available at the California State Library, the San Francisco Public Library, and the University of California Doe and Bancroft Libraries. 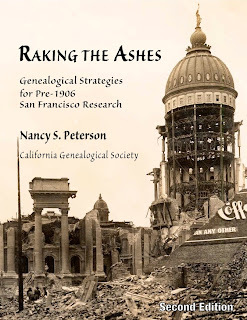 In this book, Nancy Peterson has created a wonderful resource guide to help genealogists find the available pre-1906 records in San Francisco that define their elusive ancestors. Every major city should be so lucky! Even more valuable to all researchers are, I think, the examples in this book of the substitute records that may define the lives of our ancestral families – they provide hope for researchers in places where historical records have been lost or destroyed. I started out reading this book for the history, not understanding the real purpose of the book. There is some historical detail and many historical pictures, but I ended up greatly appreciating Raking the Ashes for the exhaustive description and details of the genealogical and historical resources. This book is a must-have for researchers with Bay Area ancestry, and should be on every genealogical library shelf, and could be used as an excellent example for researching in any locality. Saturday Night Genealogy Fun - it's Wordle Time! Dear Randy: Where did Texas Death images go?